Plum pit qi (sensation of phlegm accumulation in the throat), chest oppression, cough with white phlegm and occasional vomiting. 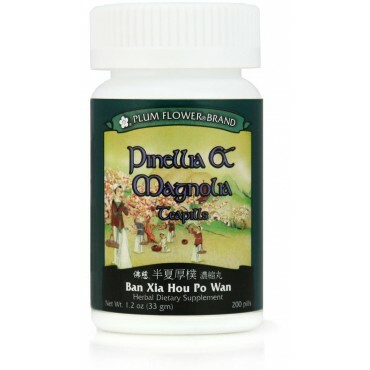 Esophageal constriction, chronic bronchitis, chronic pharyngitis, asthma and emphysema, poor digestion due to food stagnation are some of the imbalances satisfied clients have used this product for. Poria cocos fungus, Pinellia ternata rhizome-gingered, Magnolia officinalis bark, Zingiber officinale rhizome-fresh, Perilla frutescens leaf, Activated carbon, Botanical wax, Talcum. - Fu ling, Jiang ban xia, Hou po, Sheng jiang, Zi su ye, Activated carbon, Botanical wax, Talcum. Contraindicated for complaints due to Yin deficiency or excess heat. Use with caution during pregnancy.